heating pad | Troy C. Wagstaff aka CallahanWriter Blog: Topics of interest include Western Historical (1865-1899) Topics. Additionally inspirational Christian and Fibromyalgia interests. Fibro Travel, A Reality Check. I just went on a three-day two-night trip from Utah to Laramie Wyoming, located on the far eastern side of Wyoming. It’s a six to seven hour trip and about 580 miles one way. My wife is a professional photographer. She had a friend that paid our way to drive out to Laramie and she paid our gas and food. All we had to do was drive out there. I will tell about things learned from the road trip and things we did right by comparing our experiences to the lists in the previous two articles on traveling. Let’s see how I did on this short little trip. 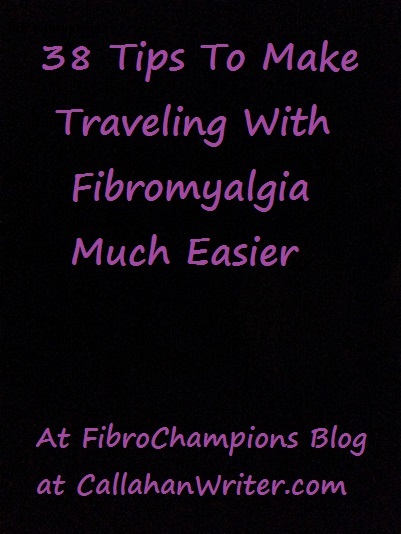 I am analyzing this trip against the 31 Tips For Traveling With Fibromyalgia . We left Sunday morning and arrived home Tuesday about 12:30 a.m. What did I learn from what I have written and from past experiences? How did I do in reality? Not only did this limitation issue go well, but when my wife and I were planning it, my wife was thoughtful of my limitations. 2. List of medications and Medical history. Numbers two, three and four are on the same piece of paper in my wallet with a small overview of my health history. Did this one as and usual I didn’t need it, but it is smart to do because you never know. Knowing your limitations and managing them are two different things. Did a good job with managing our expectations. My wife does well with this by now and our friend we went to see was very understanding. We did have to explain some issues but she was accepting of them all. Didn’t apply to this road trip. Knowing I would not enjoy being a part of Monday, the photo shoot day, I looked up tourist things to do in Laramie and Cheyenne and the Nebraska boarder. I did some research but my wife reminded me of my limitations so I kept my notes but didn’t plan on using them. I didn’t. I used Monday as a rest day. I worked on my Fibro Novel and read one of my books. Hot tubs would have been nice but we didn’t stay at a hotel and our friend didn’t have one. Thankfully I didn’t need one. I felt pretty good most of this short trip. We were told it was a six-hour drive but it took us seven and a half hours. Probably do to the rest time we took. We didn’t rush while gassing up. We would use the restroom facilities and walk around the store. One rest stop managed by the State of Wyoming I actually did some walking. I can cover items 12, 13 and 14 in one paragraph. Have not replaced my convertor so it’s not strong enough for my heating pad. I did use my converter for my I-phone to charge the phone and listen to music. My wires on my tens machines are broke so I didn’t bother bringing my tens machine. It always comes in handy and I missed it. 15. Make sure to get up and move around every couple of hours or as needed for your situation. We did this well. Could have done a little better but we did it pretty well. A shout out to the great state of Wyoming. The rest stops they have, are outrageously awesome. Clean indoor facilities, not “outhouse style” but really nice. They even hand out State maps for free and the have placards that tell of interesting things about Wyoming. It’s a great place to move around and let your dog out if your traveling with a dog. The only time things were out of control and I couldn’t pace myself was driving to Laramie. My wife drove about one and a half hours then got extremely sleepy tired, the tired that drives you to sleep. So I drove the rest of the way to Laramie which was about five hours. It wasn’t smart, but It didn’t hurt. I was blessed. My limits were well figured in but there was a new limit I learned about. Driving fast. Last week I read a study that said for women with fibro, their reaction time while driving is slower than someone without fibro. Fibro men didn’t show any issues. Turns out this guy with fibro when traveling at speeds of 80 to 90 mph has a slightly reduced reaction times. After a couple of scares I slowed down and felt much safer and better. I know another limit now. We ended up stopping every two hours and that worked for us. I have a special hypo allergenic pillow made from micro beads that is perfect for my neck problems and the mask I wear with my CPAP machine. I took it for sleeping but I didn’t need anything for driving. The mini van we have as extremely comfortable chairs for both my neck and head as well as my legs and back side. Didn’t apply. No motion sickness for us. 21. Preparation. But remember that with all the preparation you make you can’t plan for rough days or flare ups. But you can plan to be prepared for them just in case they happen. For me with flare ups I use a heating pad, a tens machine when it isn’t broken and my medicine as appropriate. I read, write or watch TV depending on the situation. So with my laptop and plenty of reading material and the heating pad I took care of this item very well. We had very little. Couldn’t have made the trip if my wife’s friend hadn’t paid for it in exchange for the photo shoots. We spent Sunday driving to Laramie and Tuesday driving home. The photo shoots were on Monday. I want to learn about some Wyoming history since I am a history buff and a fan of Western cowboys circa 1800’s. But I wisely took it as my rest day and it really helped. I had some excellent reading material in the way of novels and my scriptures are on my smart phone. I did a lot of reading and didn’t touch the TV at all. Never go anywhere without it, in case I need it. I don’t always need it but it’s there for the days when I really need it. While I didn’t pack very well, I did go over my meds and made sure all was in order. Prayer is a personal choice. My wife and I always start any road trip with prayer as well as starting our day with it, wrapping up our day with it and whenever needed during the day. Oops. I didn’t read my scriptures on this trip. Shame on me. Due to the knowledge of the shortness of the trip I did not bring any DVD’s. This one is important if you bring a laptop, CPAP machine or any other electronic device, even to charge your phone battery. The room I stayed in had a very ackward layout for the outlets. My friend found an extension cord which helped a great deal. I recommend at least a six-foot modern extension cord that has three pronged out lets on it. This is probably even more important in a hotel room. Since we were leaving for three days it didn’t seem like a big deal to pack the morning before we left. It worked out ok, but it was unpacking when we got to our destination that was problematic. It was hard to find the toothbrush, and it was hard to find my packed medicine. Taking a little more time and organization for packing, I believe is wise. Make sure to pack your durable medical equipment wisely and carefully. For me, my only equipment is a CPAP machine which comes with a case designed for the unique shape, the cord, hose and mask. My tens unit has a case as well but since it was broke I didn’t take it. My heating pad was difficult since it is so big and can’t be packed tightly. I just placed it loose in our van. 35. Don’t experiment with new drugs. I didn’t experiment with new drugs but came up with the idea because earlier last week I tried Exedrine for my increased number or tension and stress headaches. I was comfortable with it enough to take with me for day time headaches. I don’t use it at night because of the caffeine. 36. Prepare for a travel crash after you get home. From my small history of traveling with fibromyalgia, so far my crashes have occurred the day after I got home but this time my crash was two days after getting home. We need to be prepared for it. It can and almost always will happen within one to three days, from what I gather by feedback from other fibromites. 37. Clearly understand what going off plan will mean, consequences. This idea came about because as we were passing Rock Springs, Wyoming and I thought of Carla and Russ, some old friends of ours we hadn’t seen in 25 to 27 years. We talked about seeing them on our way back to Utah. My wife talked to Carla and got it all set up. We knew that if we said we’ll only stay for a half our it would be an hour and we knew it would make us late in getting home. No big deal but my wife needed to get to work early the next morning. Long story short we were there for three and half hours. We got very late. It was worth it and we knew we would be behind schedule. You can’t plan everything perfectly but it’s nice to be as well planned as you can be. As long as you are aware of the consequences to a deviation in the plan then you should be all right. It’s nice to be well organized when you plan. Chronic pain patients and other with chronic illnesses loose a degree of control being sick and being well planned gives you some control back so plan well and is there anything on the list I missed? This message seat cover isn’t very power full but it does the job. I took it as an experiment. The experiment was successful. I sat on it the whole time I was driving and it seem to make a noticeable difference. The big question is why didn’t I sit on it on the way home in the passenger set? I recommend it.